Right in front of FICCI auditorium lies a soothing gem called Triveni Café. Also known as Triveni Terrace Café because of the exquisite lounge-like terrace they have, adorned with little hanging flower pots all around. The aura of the place does makes you think of a setting where a mini Eden garden would have been in your balcony, green, lush and airy. The place feels so peaceful that you can literally spend hours just sitting there, but why sit when you can masticate on such splendid food! There’s an amphitheater right next to the wall of this café, as well as a dance performance auditorium, so looking at silhouettes of people rehearsing classical dance against the evening sun and people playing instruments is a common sight here. Imagine the ambience coupled with a cup of authentic South Indian filter coffee on a white cozy old-style sofa - that’s exactly what you’d get here! The best thing about this cafe is that apart from the consistent menu, they offer 2-3 new dishes every day, and this definitely is one of those few places which serve food keeping the weather in mind. They serve Hot Chocolate Milk with Pakoras in winters, and for summers they serve Bel Ka Sharbat, Jaljeera and Aam Panna. Let’s dive into menu and see exactly what’s been attracting people to this place, shall we? The Paalak Patta Chaat is quite a famous thing on their menu, and its taste is as unique as its combination! This dish has the most deceptive look ever - in the first go it looks like a bowl of English soup, but it’s nowhere less tasty than that. 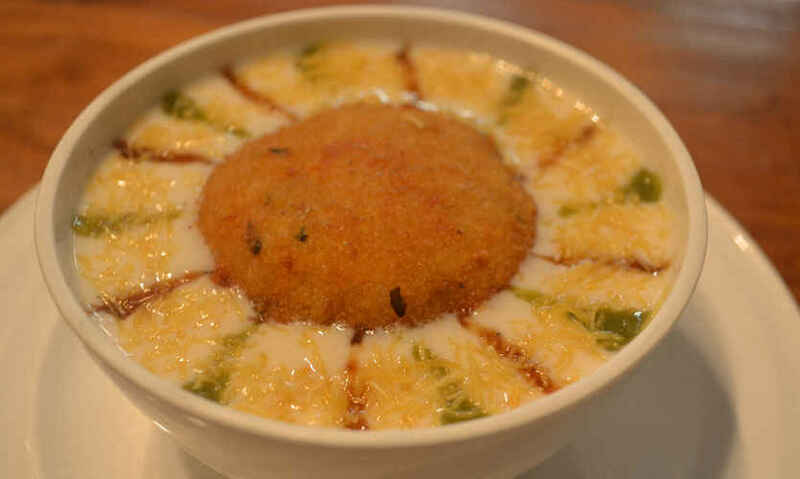 With a giant fried spinach snack resting in a corner, half visible and half dipped in a pool of sweet and sour blended curd, this dish sure gives us chill vibes! 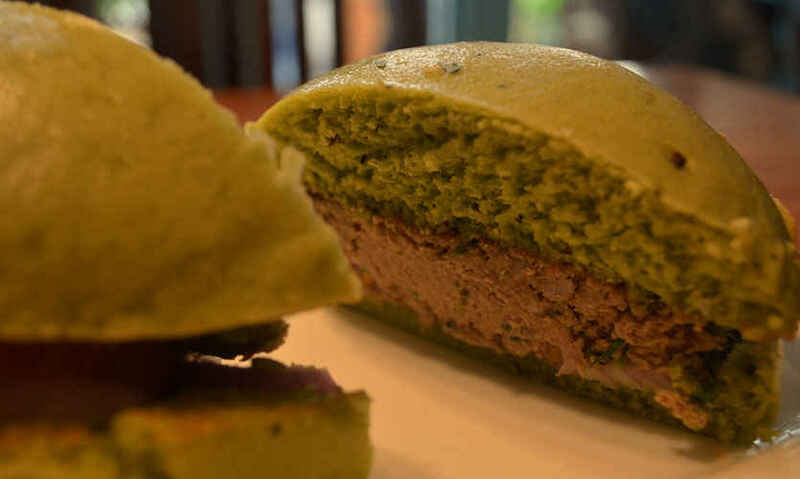 Their special bun comes in green color owing to the spinach and herbs they put in their bun. Often the bun just remains a bland cover for the patty in a burger, but here it balances the kebab with its own flavor. Their kebab is full of flavors; it’s so moist, fresh, juicy and well-made that each spice gets recognized on your tongue without compromising on the taste of meat, which you don’t usually witness. 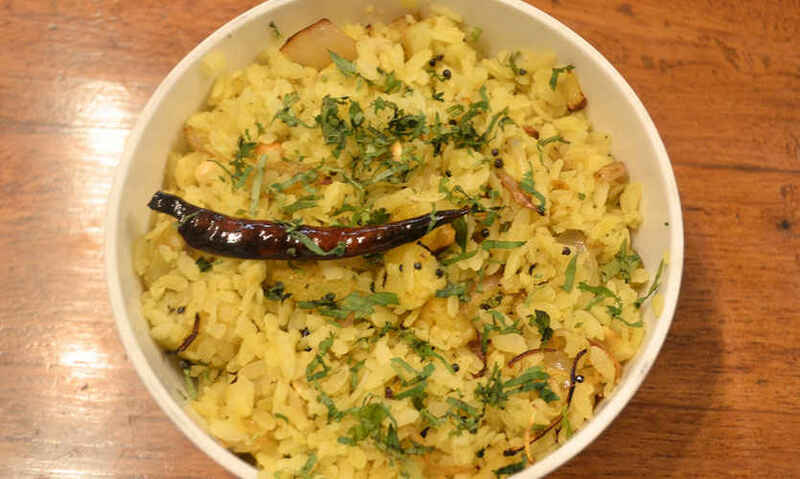 A slight fusion of herbs, lightly stir fried with chopped potatoes and then overwhelmed with light Poha (flattened rice), which tastes just perfect and gentle. Though traditionally Pohe are devoured for breakfast and are famous as a dish meant to be taken as the first meal, but here you can just walk in an order this plateful of bliss anytime you want! 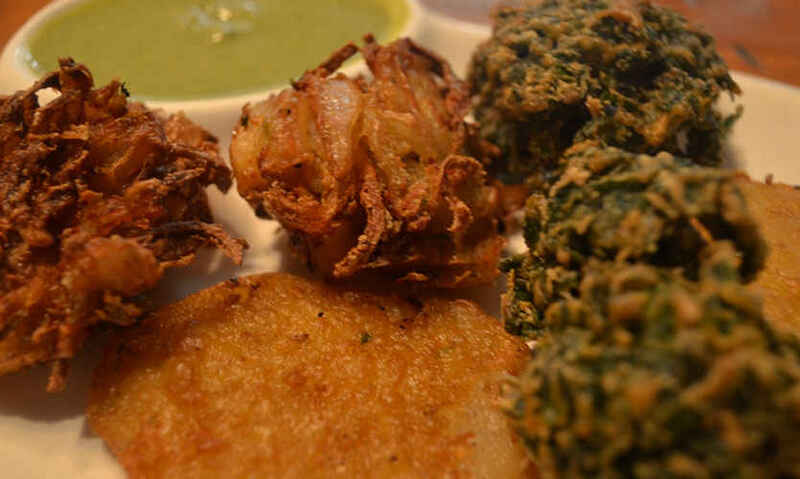 A colorful platter filled with crispy paalak, pyaaz and aloo pakoras is a must have here. Accompanied with out of the world mint chutney, this platter will make you miss rain and company (if you aren’t having one)! In fact, the whole ambience of the café compliments this platter and it seems everything was designed in Triveni keeping this dish in mind. 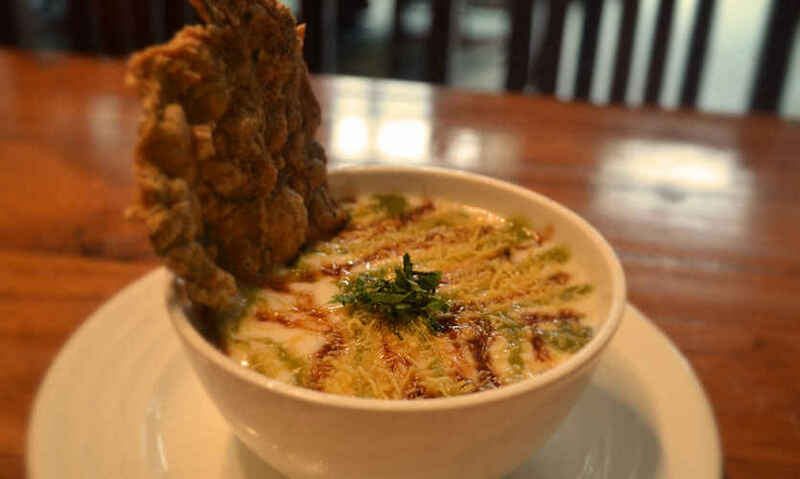 Like every other dish, Triveni’s magnum opus is also not conventional. Their Aaloo Tikki Chaat looks like a bowl of joy, with the sun in between! With the same sweet and sour raita used as a base with a fried potato patty placed in the middle, this dish tastes a lot different from the regular paalak patta chaat. As soon as the aaloo tikki gets crammed in your mouth, a flood of flavors gets unleashed. Sweet, sour and pretty - this dish is not to be missed! As the name suggests, this is a pretty hot and demanding recipe. Small red millet cake, perfectly steamed and then fried in gunpowder, this one is highly recommended. 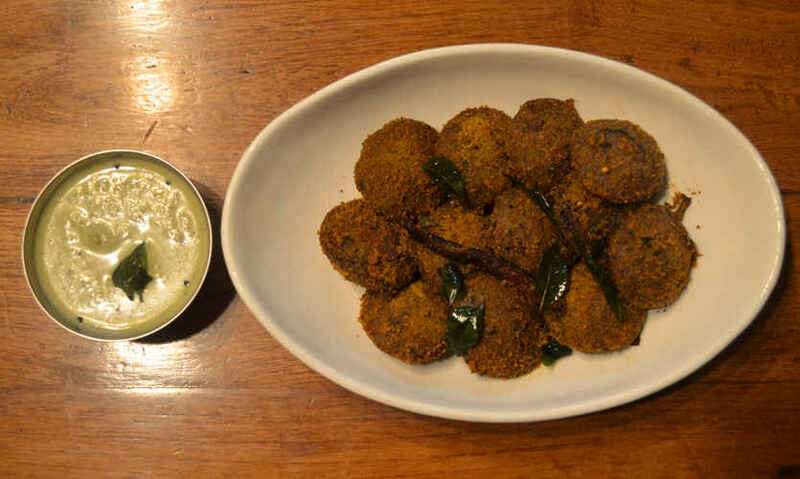 Lovely little idlis smothered in a coating of gunpowder or Molagapodi, which is a combination of roasted Bengal grams, peanuts, dry chillies and sesame, gives your tongue a kick with the first bite. The smoky and hot flavor of it remains with you for long, without getting too heavy on your taste buds. 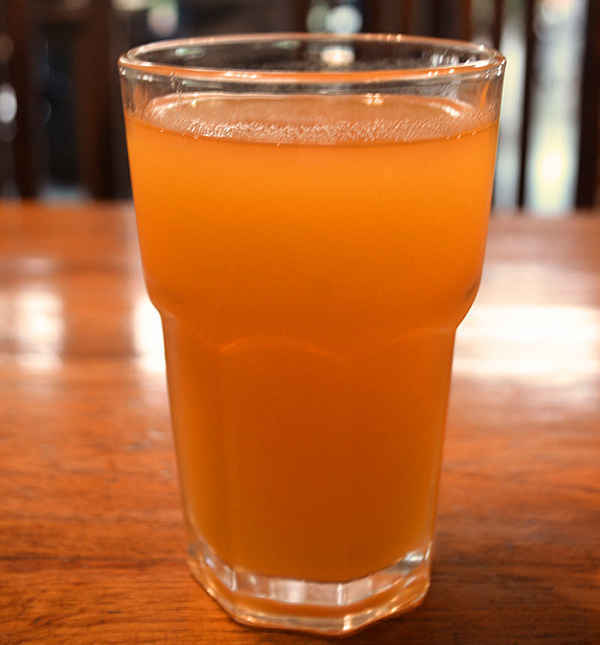 In summers they serve this delicious and chilled stone apple drink. Considering taste as the secondary reason to try this, this drink is a necessity in summers and it’s rare to find a drink of Bel being served in a restaurant. This one is compulsory after all the food to cool down your stomach. If all this is not enough and you’re up for a full-fledged meal then they’ve got Mutton Yakhni, Machi Kaliya and Shaami Kebab too! Apart from these delicacies, their Apple Pakodas, Kaddu Aur Daal ke Shaami Kebab, Aam Panna and Jaljeera are quite a hit among the foodies who love to dawdle around here! Come on over.